The National Centre for Folk Arts at Halsway Manor is a charity and the only residential centre in the world concentrating on the varied folk heritage of England. Nestling in the Quantock Hills within an Area of Outstanding Natural Beauty, it hosts courses, events and projects within this unique and magical setting. Set in six beautiful acres of gardens and grounds the manor has a warm and welcoming atmosphere, a range of comfortable bedrooms, great food and a beautiful panelled bar. For over 50 years Halsway Manor has hosted unique experiences and inspired thousands of people to experience the diverse dance, song, music and art found in our green and pleasant lands. Unique in the UK it hosts over 340 days of residential and outreach activity every year covering all facets of folk arts from instrumental music, song and dance to traditional storytelling, crafts and instrument making. We are committed to excellence and opportunity for all with a broad programme that covers amateur exploration, professional development, the creation of new work and stewardship of our heritage. 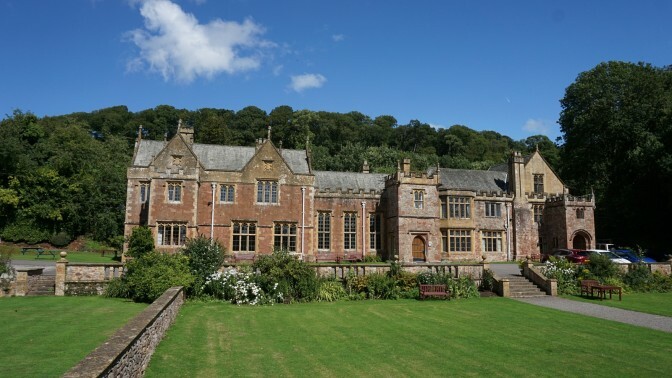 Halsway Manor is listed by English Heritage as Grade II*; the house is late 15th century with 19th century additions. Set in 6 acres of woodland and gardens, the manor’s seclusion and the warm and friendly atmosphere is much appreciated by its many supporters as being highly conducive for educational/learning activities both residential (it sleeps up to 65 people) and through our outreach programme. The manor houses the Kennedy Grant Library, a nationally important collection of about 10,000 books and recordings of folklore, customs, traditional folk music, dance and song, it is the second largest library of its type in the UK. The library is open every day to the public, researchers and participants on our courses and as part of our community work. The library is of national significance and has a number of unique items which tell the story of Britain’s folk heritage. If you would like to read more about the history of Halsway Manor please visit Our History.